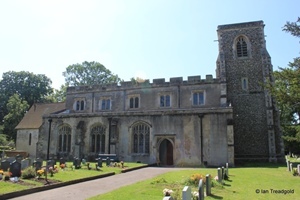 The parish church of St Peter in Arlesey is situated unsurprisingly in the Church End area of the town near the railway station. 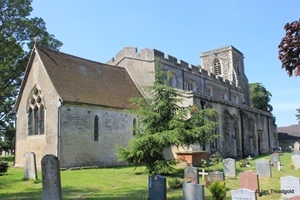 Situated on a reasonably large area of land the church is a highlight on the main road through the town. 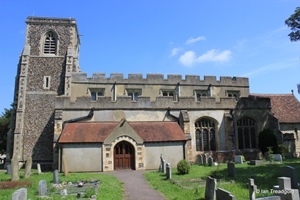 Internally there is evidence that parts of the church date to the 12th century originally as a simple aisleless nave with the two aisles being added gradually during the 13th and 14th centuries. The nave is some 64ft long and 17ft wide with the chancel adding a further 16ft in length with a width of 26 ft. The two aisles add around 10ft each and the modern tower is around 12ft square. 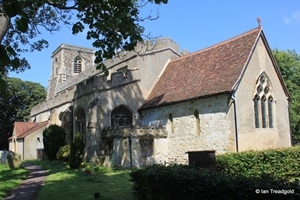 The church has entrances on both north and south sides. 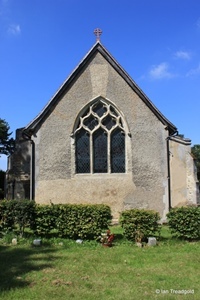 The north aisle has three windows with the clerestory above holding five windows below an embattled parapet. 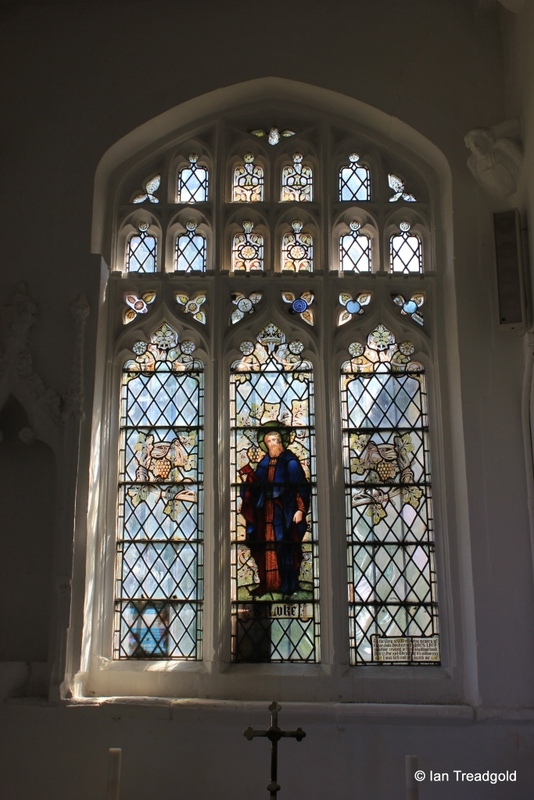 The chancel is simple in style with two narrow windows on each side. 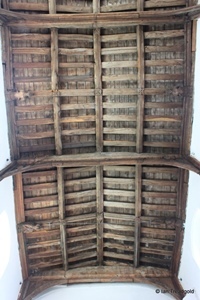 The chancel roof rises steeply almost to the height of the main church. 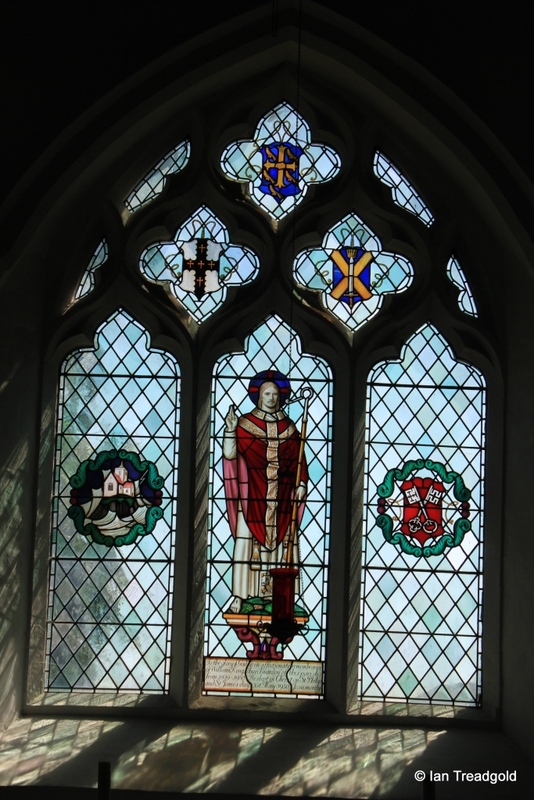 The east window has reticulated tracery with simple stained glass depicting the church's patron St Peter along with manorial crests. 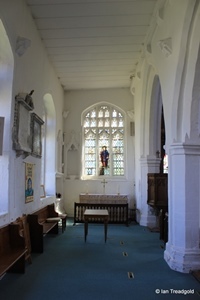 The south side of the chancel has seen major development over the years. 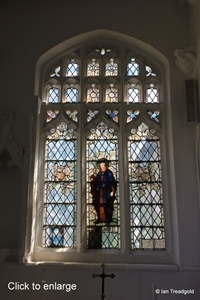 Originally there was a second building of similar size to the chancel which served variously as a chapel, vestry and school before being demolished in 1855 to be replaced by the current vestry. Lines of the original roof can still be seen in the remaining brickwork. 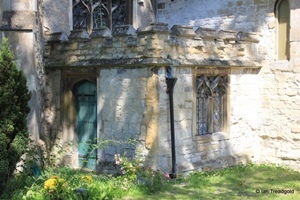 The current west porch is a relatively modern much grander entrance than the original porch which was about a third the width of the current structure. 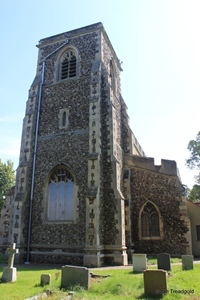 The original tower collapsed in the 1600's and was replaced for many years by a very small wooden belfry. The current tower was built in 1877 with three levels and houses the peal of six bells. 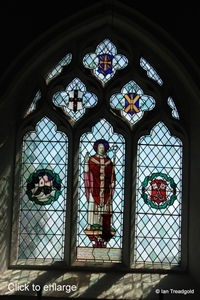 Altar in the North aisle and stained glass depicting St Luke. 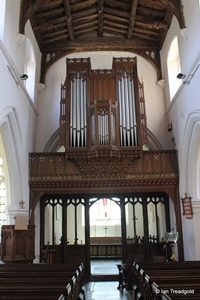 The chancel arch with organ loft over and the impressive timber roof of the main nave. Page last changed 03/09/2014, reformatted 10/07/2015.